Trade shows are a constant battle to be seen and to stand out from the competition. Everyone walking past your booth is a potential customer. You need printed marketing materials that can turn the potential into the actual. No one sign can accomplish all these things, so it’s essential to create a comprehensive package of marketing materials all geared towards accomplishing your trade show goals. Get the visibility you need with eye-catching banners. Big and bold, banner displays give you the chance to make a statement. Is your message professional, dramatic, inspirational? Do you want to share information or fly your logo high—or both? 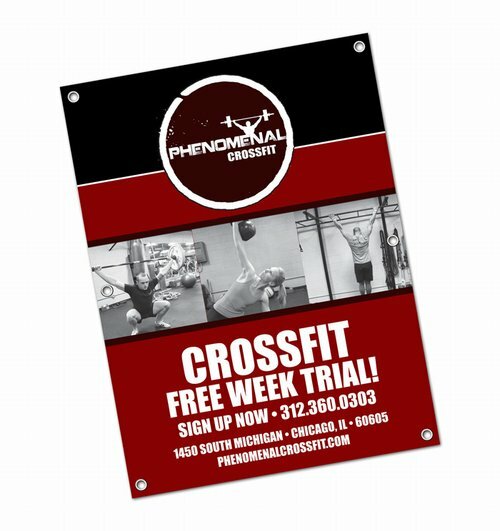 Standing or hanging statement banners are an impressive catch-all way to achieve multiple goals and draw people to your booth. Table talkers are a fantastic supplement to your banners. Use them to ask your customers engaging questions, offer enticing specials, or highlight a specific product or service. You can even show your brand personality with entertaining or educational tips, quotes, photos, and more. Here is your opportunity to share your story. From the physical shape, size, and feel of your brochure down to every letter of copy and splash of color, this is your most effective and important tool at any trade show. Keep branded notepads on hand at trade shows for both your team and booth attendees to use. The personalized touch of a handwritten explanation, outline, or quick quote will make your interactions more memorable. Think of these as an extension of your business card and include logos, contact information, taglines, and other pertinent information. Whether you’re taking orders, building a quote, or creating an order example, a custom form is professional and memorable. Trade show attendees will likely be collecting multiple quotes throughout the show, so you need your form to stand out from the stack. Your custom form tells potential customers a lot about your purchasing process. Is it designed to be quick and easy or thorough and specialized? Make the most of this oft-overlooked opportunity to tell your customers a little more about your company mission. And don’t forget about sign-up forms. While lead generation is usually done electronically, you can use physical sign-up forms for trade show appointments, on-site giveaways or raffles, and more. Use this as an excuse to gather more information about your customers or share more information about yourself with these forms. Some trade show attendees shy away from collecting large brochures they’ll have to carry around all day. For those potential customers, a dynamic and concise postcard can do the trick. You can also use a postcard to supplement your brochure and highlight a product, service, or special promotion. “Swag” is practically mandatory at trade shows these days, at least according to the regulars who will only stop to pause and grab a “freebie.” It’s vital you take this opportunity to offer a gift that is both useful and branded. One of the best ways to do this is with magnets. A magnet is a creative blank canvas to offer a fun and functional reminder of your company, products, and services. Magnets can even turn those “freebie-grabbers” into future customers! 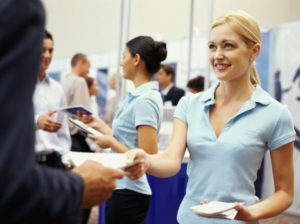 Give your booth attendees a reason to look you up after the trade show by handing out loyalty cards. Take the time to offer coupon cards, fully or partially filled out punch cards, club memberships, gift cards, or any other incentivizing card. A loyalty card is always appreciated. Make sure your business card is memorable and correctly represents your company. The perfect business card should not only remind the holder of your conversation but also inspire action—a call, email, or website/store visit. Content And Message: Inspire action; create a memory. Font: The style and size depict the industry. Color: This is the beginning of your branding journey. Material And Finish: The feel of the card enriches the experience. It’s a good idea to create trade-show-specific business cards that highlight a service or product you’re promoting at that event. Keep in mind that many people will want to make notes on your card, so leave space for them to do so. Think outside the box—and off the page. What printed tools do you need to accomplish your trade show goals? Set up a collaborative atmosphere with a dry-erase wall covering. Go big with a custom oversized banner. Make a statement with Akuafoil, silk lamination, or frosted plastic. Will you be holding giveaways, raffles, drinks, or any other events? Stay consistent with branded tickets and invitations. You only get one chance to make a first impression at a trade show. Make it count by utilizing a range of printed marketing materials that both inform and excite passersby.